The renewed appeal of commercial real estate investment which took hold in Calgary in mid-2016 has continued through the first six months of 2018, according to a new report by Barclay Street Real Estate. The company, in its mid-year analysis, reports a 23 per cent year-over-year increase in dollar volume at the end of June, with total sales of assets worth more than $1 million jumping to $1.26 billion. The charge was led by the office market, which represented 27 per cent of investment across all asset classes. Investment increased 16 per cent year-over-year in the office market to $340 million. The number of sales in the first half of the year dropped to 17 from 18 for the same period a year ago. Kelly Carver, vice-president and associate broker at Barclay Street, said the increase in investment has been a long time coming. “The key to that is that there’s just been a lack of product that met the bid number,” Carver told RENX. “We’ve had multiple people from all across North America looking at our market because of the huge devaluation in values. “I guess what’s happened in the last little while . . . finally there’s been some product that has met that bid and it’s significantly lower than what expectations were a while ago. “So you’ve got long-term thinkers of this market and opportunistic buyers. And there’s a lot more that are sniffing around right now looking at it, because if you can buy office product at $100 to $150 a (square) foot that was trading at $300 to $400 a foot a few years ago, it just looks like a good deal. For example, he said F1rst Tower sold in May for $147 a square foot ($107 million) to U.S. firms Hines and Oaktree Capital Management. 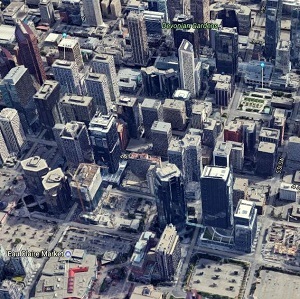 The 27-storey class-B building, comprising 708,354 square feet of leasable space in downtown Calgary, had been assessed at $233 million, Carver said. “Companies that own office properties that they want to sell may need to write down the values to justify selling. The prices these properties are selling at are more than half of what they purchased them at,” Carver explained. “With the bottoming of the market, buyers are prepared to underwrite at current rents and look for upside in the medium to long term. – and four per cent for multi-residential. “There’s a lot more demand than supply in Calgary, which is a good thing,” said Carver. He said Calgary’s economy is not yet robust, but the worst appears to be behind it after recession years in 2015 and 2016 following the collapse in oil prices in late 2014. The economy rebounded in 2017 and has continued to grow this year. Contrast that with Calgary’s retail market, which has remained robust. Year-over-year investment in retail more than doubled to $173 million. Activity also rose by about 35 per cent to 27 transactions completed by the mid-point of the year with the majority of sales focused on retail properties priced in the $1 million to $3 million range. Total sales during the six months were 27 compared with 20 a year ago. “In retail, there has been some true stabilized assets that have sold but the majority of them are people looking for opportunities,” Carver said. “So they’re looking for either something that’s stabilized, shiny and new or something that there’s holding income and they can add value to it. The Barclay Street report also highlighted residential land, where the market jumped in sales to $217 million in the first six months of this year. That’s an increase of $42.5 million compared with the same period in 2017. There were 38 sales compared with 21 last year. – ICI Land sales jumped to $196 million from $98 million. Sales rose to 39 from 29. “Investors are back in Calgary’s commercial real estate investment market and their wallets are open,” said George Larson, vice-president of investment sales for Barclay Street, in the report.